A courageous sea dog who saved the lives of two sailors in World War II has been honoured more than 60 years after his death. 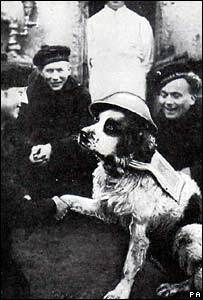 Bamse the St Bernard became a national hero in Norway for his efforts on board the minesweeper the Thorodd. He has now been awarded the gold medal for gallantry and devotion from the PDSA veterinary charity. Bamse, who died in 1944, also became a local legend during his time stationed in Dundee and Montrose. Among the dog's exploits was saving a young lieutenant who was set upon by a knifeman by knocking the attacker into the water. The 14-stone dog also rescued a sailor who fell overboard, going in after him and dragging him to the shore. Bamse, which means cuddly bear, became a national hero and a symbol for freedom against Nazism in Norway for his exploits on board the Thorodd. He was loved by locals in Angus, where the ship docked during the war. All the schools in Montrose were closed as a mark of respect when he died at the dockside on 22 July, 1944. PDSA chairman Freddie Bircher said: "This dog was a devoted mascot to the men of Norwegian Navy minesweeper the Thorodd and a faithful friend to all who lived and served with him during the dark days of World War II." Wearing his trademark tin helmet, Bamse used to take up a position by the foremost gun turret of the Thorodd. While ashore, the friendly dog became a familiar sight in Dundee and Montrose, decked out in a white sailor's collar and mariner's cap. He would lead sailors home from the pub and was even given his own bus pass. Andrew Orr, chairman of the Montrose Bamse Project, a group dedicated to keeping the legend alive, said: "Memories of Bamse and his wartime exploits live on in the people who remember this gentle giant of a dog. "We are so pleased and proud to see Bamse honoured with the PDSA gold medal."